In this 65 Sq. Mt. apartment, with comfortable and traditional facilities, your leisure is warranted! A traditional accommodation to make you feel like a member of our community! 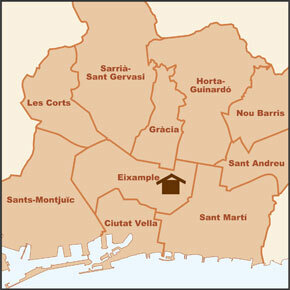 It’s situated in the barrio L’Eixample, very close to Gaudi’s temple of the Sacred Family. A quiet apartment with two balconies, situated very near the sites of interest. You won’t need a thing! Our 65 Sq. Mt. apartment can house groups of up to five people. It has two bedrooms and three single beds. If you’re traveling with a child, we can place a crib in the room, to make you feel at home. Take a rest in our living room. You’ll find a comfortable sofa bed, a TV. , DVD, all for your pleasure after a day exploring the wonders of Barcelona. The living room also serves as a dining room, with a table in which you can enjoy the delicacies prepared in our state-of-the-art kitchen. In addition, you have access to WiFi throughout the apartment. L’Eixample is a great neighborhood for your vacations. It’s located right by the sites of interest, such as the Passeig de Gracia and the Par Güell. You’ll have easy access to the main transportation means, while you staying at a quiet, pleasing apartment, away from noisy crowds. Make the most of your stay! Located in the popular La Sagrada Familia area, this is a setting ideal for families, couples or business travellers who want to enjoy a quiet yet well connected area. Gracia is one of Barcelona´s more unique districts. This was once a village and even today as it totally incorporated in central Barcelona it is characterized by a spirit of independence. This area has it all: great food markets, delicatessen, exciting shops, a great variety of international restaurants, a vivid nighlife and easy access to all of central Barcelona!